Diabetes requires patients and their Doctors to actively and regularly track their glucose levels and insulin injections. With the Neptun Diabetes Management app, Diabetes patients can now track their data right on their smartphones. From blood sugar levels and insulin injections to fitness data, the iOS app takes the place of manual note-keeping. It can even synchronize automatically with Accu-Chek® glucose tracking devices and insulin injection pens for easy, stress-free tracking. Neptun Diabetes Management is the first app to combine blood glucose and insulin data with users’ Apple Health data, allowing doctors and patients to gain deeper insights for improving their Diabetes therapy. 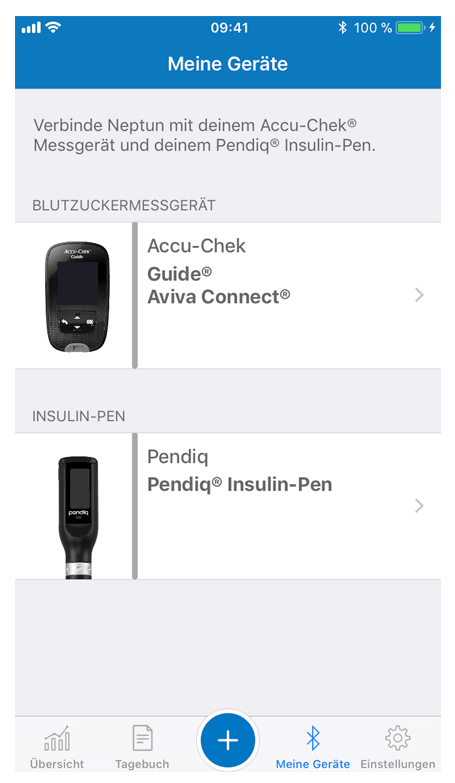 We developed Neptun Diabetes Management in cooperation with Roche Germany, Linova Software GmbH, and researchers at the Technical University of Munich. Keeping momentum with an efficient, agile process – considering the number of parties involved – was a main challenge and achievement during the project. Regular SCRUM meetings and continuous delivery were key to efficiently bringing the app to market. Additionally, Neptun Diabetes Management has the classification of Medicine Product Class I. We made sure that the development process and the resulting app fulfil the requirements that this classification brings along. To meet the high quality standards of Roche, automatic and manual testing strategies also formed an integral part of the development process.